Abu Dhabi: New Zealand batters disappointed but their bowlers struck early and Pakistan were 59-2 in 23 overs at stumps on a wicket that is already offering vicious turn on day one of the first Test at the Shaikh Zayed Stadium on Friday. Harris Sohail and Azhar Ali were at the crease on an unbeaten 22 and 10 respectively with Pakistan trailing New Zealand’s first innings total by 94 runs with eight wickets in hand. Colin de Grandhomme and Trent Bolt got the key wickets of openers Imam-ul-Haq and Mohammad Hafeez respectively. 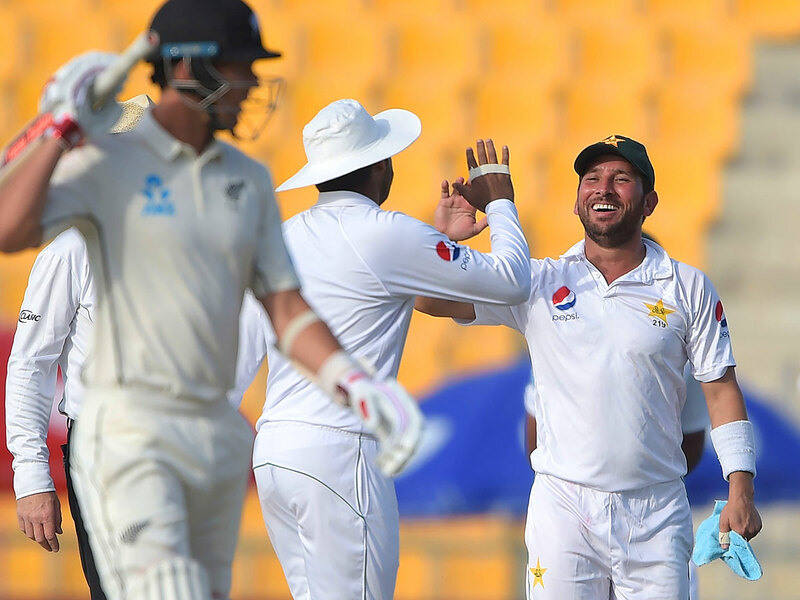 Earlier, Pakistan bowled out New Zealand for a paltry 153 in 66.3 overs as the visitors lost seven wickets in the second session for 72 runs in 29.3 overs. Leg spinner Yasir Shah, led from the front with 3-54, while Mohammad Abbas, Hassan Ali and Harris Sohail claimed two wickets apiece. Toss has always been crucial on these wickets in the UAE and when you win one, then you bat first and bat big. New Zealand chose to take the first share of the crease but most of their batsmen looked woefully out of touch for their first away Test series in two years. Only skipper Kane Williamson was an exception as he showed the temperament and skill to match Pakistan’s bowling firepower. Their openers did weather the new ball for the first 10 overs but Abbas, who has emerged as the best bowler in the world with 59 wickets at an average of 15.6, kept probing outside off-stump and was rewarded with the wicket of opener Jeet Raval — caught behind. As expected, it was leg-spinner Yasir who put the Kiwis completely on the back foot as soon as the ball was tossed to him. Tom Latham will be hugely disappointed with the shot that he played off Yasir as it was a feeble chip straight to Mohammed Hafeez at short mid-wicket. A lot was expected from Ross Taylor, one of the most experienced players in the squad. However, he failed to rise to the occasion and fell prey to Yasir while playing away from his body and edged one straight to Sarfraz Ahmed and New Zealand were reeling at 39-3. Williamson then showed why he is No. 3 in the ICC Test batting rankings. The skipper, who averaging 50.35 in Tests, batted sensibly in the company of Henry Nicholls and New Zealand made it to lunch without any further setbacks at 81-3. Williamson, then with his 50 off 88 balls, also brought New Zealand’s 100 on board. Nicholls was very watchful until then for his 28 but he chased a wide delivery from Abbas and Sarfraz made it look easy behind the stumps. Speedster Hassan then broke the back of New Zealand’s innings with two wickets in successive deliveries. The first one was the big wicket of Williamson. The skipper trying to go for a pull off a nothing delivery from Hassan found a faint touch off his glove and it was ordinary work for Sarfraz. A fired-up Hassan was then on a hat-trick after leaving De Grandhomme rooted in front of the stumps with a brilliant reverse-swinging delivery. With Harris joining the party dismissing Ish Sodhi leg before, New Zealand looked miserable at 127-7. Harris then extracted enough turn to trap BJ Watling in his spin-web and the remaining tail wagged a little to take the score to 153 before being bowled out just before tea.